Indie Retro News: Legend of Atlantis - Indiana Jones style C64 game is looking so good! 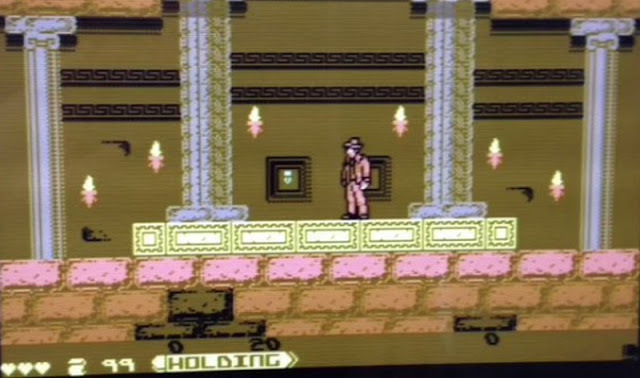 Legend of Atlantis - Indiana Jones style C64 game is looking so good! Once again we are giving a grand heads up to our gaming fans as we've just found out through smilastorey‏, that their glorious upcoming C64 game of ' Legend of Atlantis ' has a new gif tease showing almost complete working controls! This game which we have been keeping an eye on ever since it was first announced, showing off what looks to be Indiana Jones with his whip ready to deal some damage. Is looking to be the next best game coming from T Storey, G Rottensteiner, A Volkers and S Collier! It's amazing how many games have been announced by the same team through the years, especially with Barnsley Badger, My Life, The Sky is Falling, Soulless 2, Organism, Argus and now this one. So it stands to reason why they are so highly respected and why every time something gets teased it pretty much always ends up as a finished project. So keep watching this space as at some point soon I'm sure they will actually show off proper gameplay footage!